How far can he go before he goes too far? Whoa, this is quite a spectacular teaser poster for an independent film that otherwise takes place on the ground, inside of a limousine for the entire time. 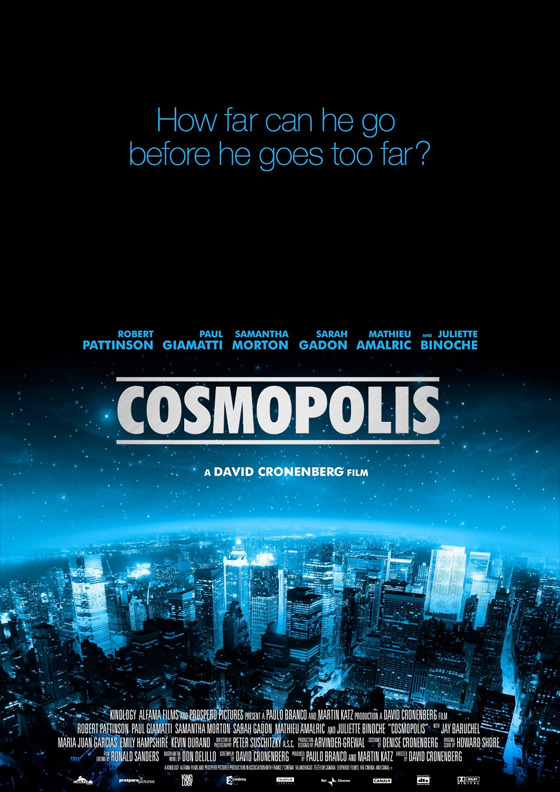 Kino Gallery (via Collider) has a new poster for David Cronenberg's Cosmopolis that indeed stars Robert Pattinson, but who isn't even seen on the poster. This is the film about a multimillionaire and his 24-hour odyssey across Manhattan in a stretch limo, just for a hair cut. I love this design though, the global view of the Manhattan skyline in a deep blue, just something appealing about it - and gladly Pattinson's face isn't on it. Take a look! Note: this is just fan art. Click for high res. We've featured other cool artwork for this and a first look before. Update: Apparently this is a fake fan art poster (via The Daily Blam) but it's still cool, so I'm leaving it up! David Cronenberg (Scanners, Videodrome, A History of Violence, Eastern Promises) writes/directs this adaptation of Don DeLillo's novel following a wealthy asset manager (Robert Pattinson) who crosses the whole of Manhattan across 24 hours in a stretch limo just for a haircut. However, the guy can't get a break as he's repeatedly delayed by a presidential motorcade, anti-globalization demonstrations, and a celebrity funeral. But his biggest problem comes when he must deal with the repercussions of a risky bet against the yen on a bad day for the market that may cause him to lose all his money and his newlywed bride. Sarah Gadon, Kevin Durand, Jay Baruchel, Samantha Morton, Juliette Binoche, Paul Giamatti, and Mathieu Amalric also star. Expected release will be sometime in 2012, but there are no other details yet. FYI: This was proved to be fake yesterday. Whoa, really? Do you have any other info? Damn! I always hate when this happens when it's a GREAT poster that totally LOOKS real in every way! Update: I've edited and added notes above, but I still think it's a cool poster so I'm leaving it up - thanks again! there is a real poster out, but this isn't it. Sounds very Phillip K. Dickish...I may have to check out the novel. This is indeed a cool poster but I have to disappoint you: the only official poster is one of Eric Packer in his limo and it is a very cool one too. Both are representatif for the movie but it was to expect that Eric would be on the poster as the whole book is about his odyssee through New-York. A very interesting and actual read, a book with many layers. It's a big challenge for DC to bring the story on screen and a big challenge for Rob Pattinson to bring Eric Packer alive. I've trust in both that they will deliver.